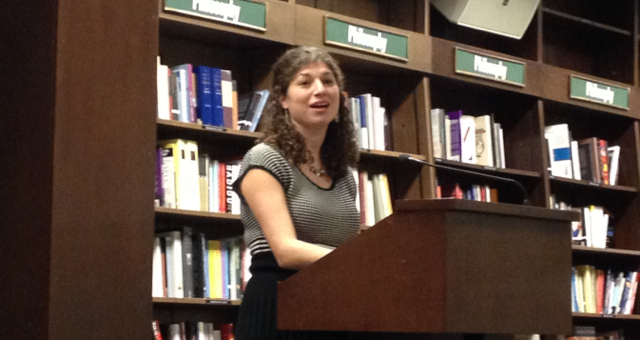 Tova Mirvis returned to the Upper West Side to read from her new novel Visible City. The 82nd Street Barnes and Noble served a fitting host for the sprawling novel that unfolds in the surrounding neighborhood. Mirvis began writing Visibile City a decade earlier. She had just left the Upper West Side for a suburb in Massachusetts outside of Boston, and missing the old neighborhood, began constructing a story centered on it. “I felt an urge to write a novel about what I left,” she said. Mirvis also wanted to explore the city below ground. Many new buildings have come to the Upper West Side in recent years, developments she followed even though she no longer lived in the neighborhood. But while the surface changed, the unseen places below ground remained. She learned about ghost subway stations, the abandoned stations that riders can glimpse if they remember not to blink as the train speeds by. She researched these spaces on the internet and on blogs. She subscribed to listservs. The idea of urban explorers intrigued her. She wanted to know why they found exploring these old abandoned spaces so fascinating. “As a novelist, I’m always interested in: ‘what’s this about’?” she said. Mirvis was also interested in the interplay between the intimacy of the city and vast loneliness. To her, to be surrounded by other people amplifies those feeling of loneliness. It seemed to her an essential question for the novel. She constructed a novel around characters who end up observing each other and interacting within the space of the neighborhood. Moving to the suburbs has lead her to develop a greater sense of voyeurism, and she says she regrets never having felt that urge while in the city. “I was happy to live in the Upper West Side without curtains,” she says, because the social contract of the city is accepting that your neighbors will see you, you see them, and nobody ever says anything. But the first thing she did when she moved to Newton, Massachusetts, was invest in a nice set of curtains. The city offers “the constant sense of possible encounters,” she says. Still, her version of New York City remains the city she left ten years earlier rather than the city it is today. Mirvis allows her characters to evolve the story. She developed Nina first, and then filled in the others from her as needed: a husband, someone for her to take care. And after ten years of working with the characters, she says they feel like old friends. “There was a letting go. There was a feeling they were no longer inside of me,” she says when she finished the book. Though she lives outside of Boston, writing the book gave her plenty of excuses to return to the city. She describes it like visiting the set of her novel. And of course there is something special about New York. After moving to the suburbs of Boston, a friend asked Mirvis if she got to the city often. She replied that she did–about once a month. Only later did Mirvis realize the friend meant Boston. To Mirvis though, the city is always New York: “it was clear this was always the city,” she says. Now she says her next novel is set in Newton which could mean fewer excuses to return.